Will the J&M SS hose kit work with this replacement brake kit? Also Im a fan of OE Parts however is there any other option that LMR Offers to possibly upgrade my brake system while keeping rear drums and front disk? if so any suggestions? That hose will work just fine on your application. 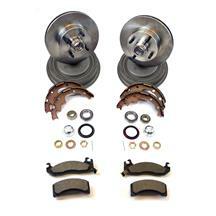 We do offer a complete performance upgrade kit, part number SVE-BP1. This does stoptech pads/shoes, and J&M braded hoses. The pedal will be much firmer and stopping capability is drastically improved with this kit. All you would need in addition to it is part number LRS-1102D x2 for the front rotors, and part number LRS-1126B x2 for the rear. I'm a fan of OE parts as well, but in the instance of fox brakes, I'd recommend going this route. It makes a big difference. The 4 cylinder cars had smaller brakes on the front. If your car is a factory 5.0, then these will bolt right on.